Hie thee off to ye olde Goodwill. 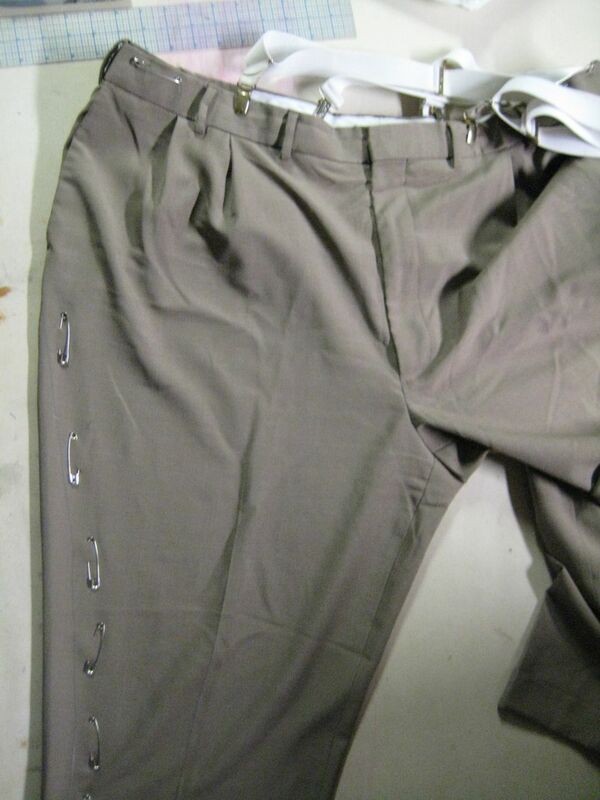 Find pants that fit round the proper waist of your victim. For this, you will need their real waist measurement which will generally be a bit different to the measurement they’re used to buying pants with. This can be a fairly sensitive topic with a lot of guys, so I strongly recommend a) not letting them see the tape or the measurement sheet, b) lying and telling them you’re just making sure you have a size range to work with since, you know, Goodwill and all, and c) reminding them that this is one of those “I am my own dorky gran-paw” areas of history in terms of where you pants end up, and they will not look like a big fat man. (They will look like Humpty Dumpty. It’s just one of those lamentable things. On the plus side, this really does minimize the tummy…) I’m not actually kidding about this. Before you ask, the larger the pant, the deeper the crotch seam, so there’s not much danger of anything being squarshed in there. 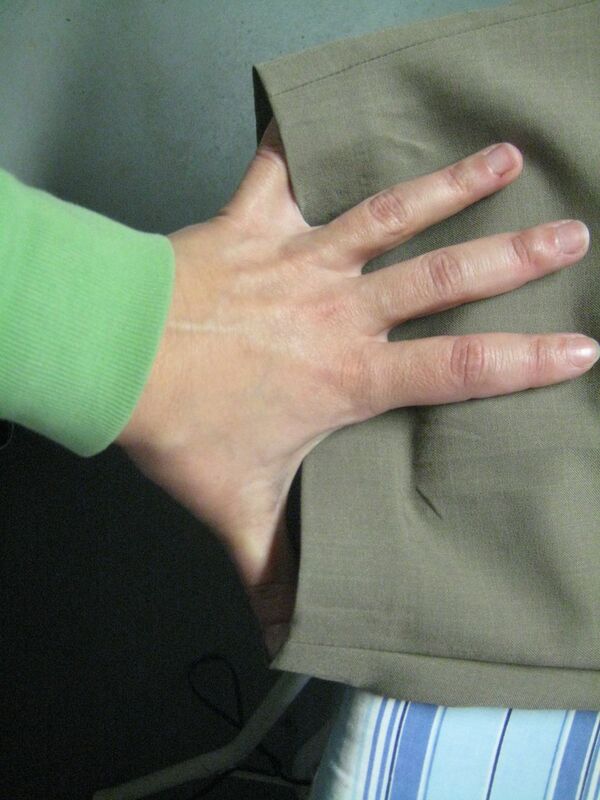 Your ideal pant is a flat front. Pleats will make this trick more difficult. 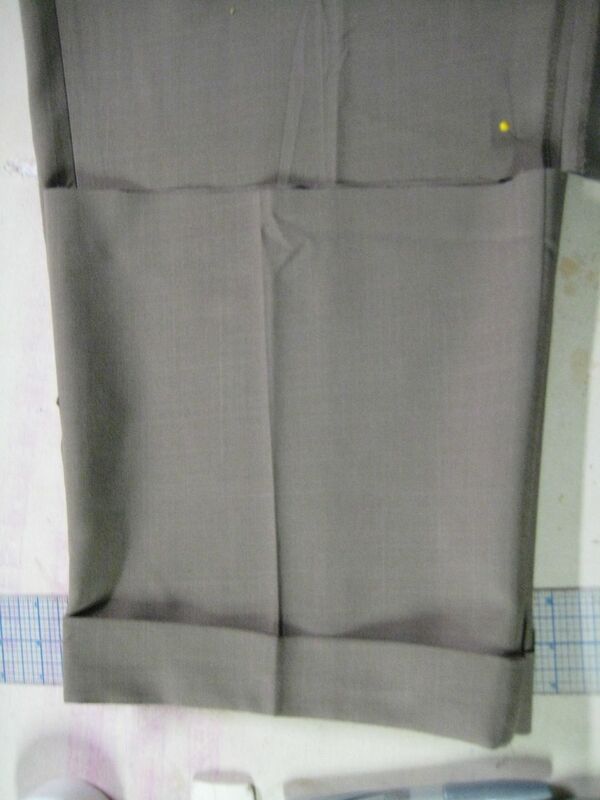 I only fit one side of the pant, and try to keep the taper below the pocket if possible. 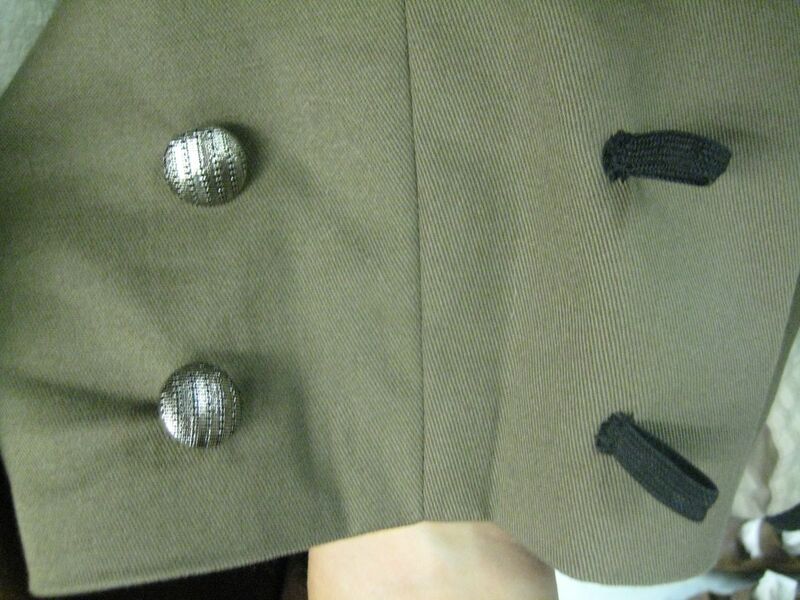 There's a pin marking the location of a safe hem. Whack off the hem 1 1/4" below the pin, straight across. Make a smooth curve 1/2" outside the fitting pins, on the leg and cut. This is going to work best if you were careful during your fittings, and you kept everything neat at the side. If you’ve got things bunched all up between pins, your life will be slightly less happy. 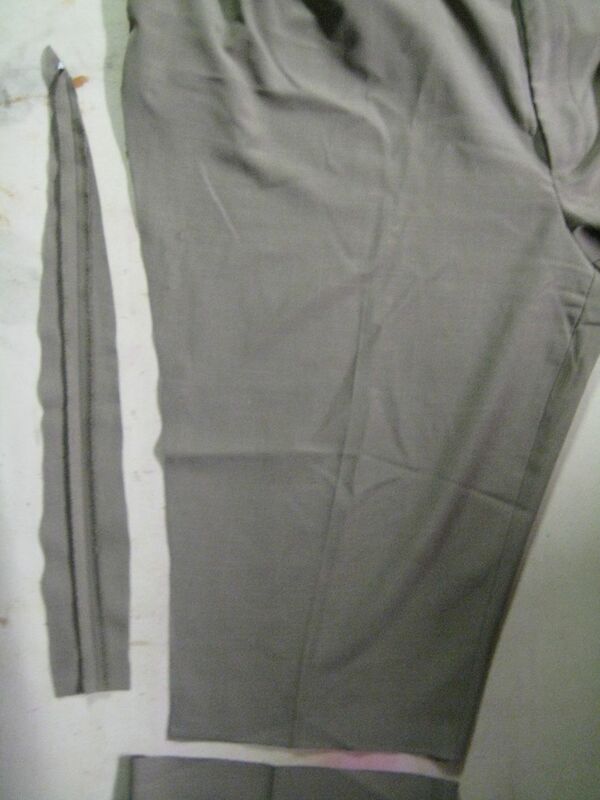 To transfer the hem to the other leg, you can either a) measure carefully, or b) use the piece from first leg as a template. I like option b, because it's faster. I transfer the side markings with the same trick. It's just easier. I serged all the edges, because I have a pathological hatred of raw edges. If you had to cut a pocket, catch it in the serge. 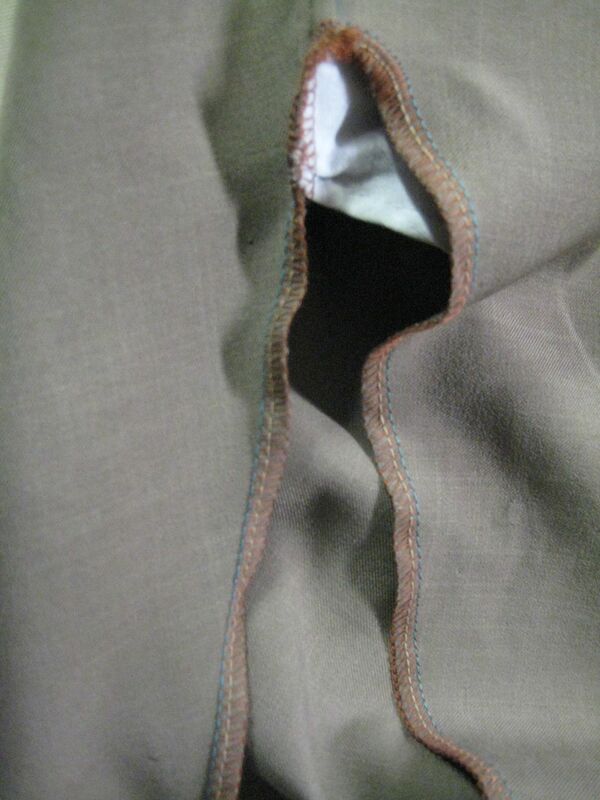 Sew the seam at 1/2". This is the other nice thing about serging it - you get a 1/2" seam just by running the edge of the foot next to the edge of the serge. 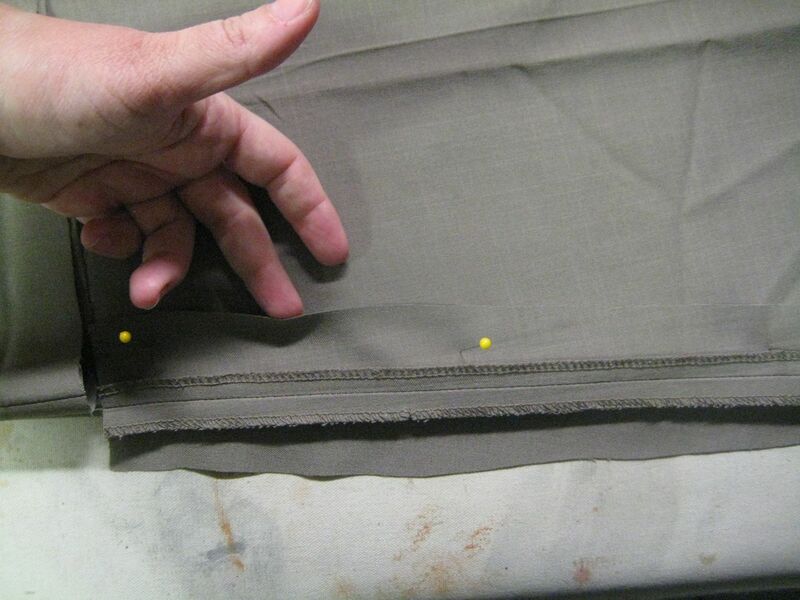 The hems should all be lovingly done by hand. 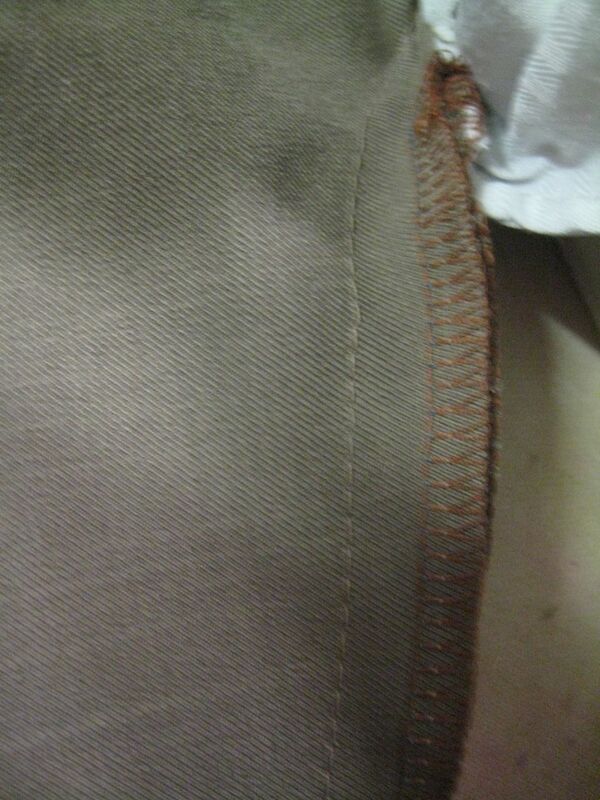 I don't have time, but I don't want machine stitches to show, so I'm cheating with iron-on hem tape. 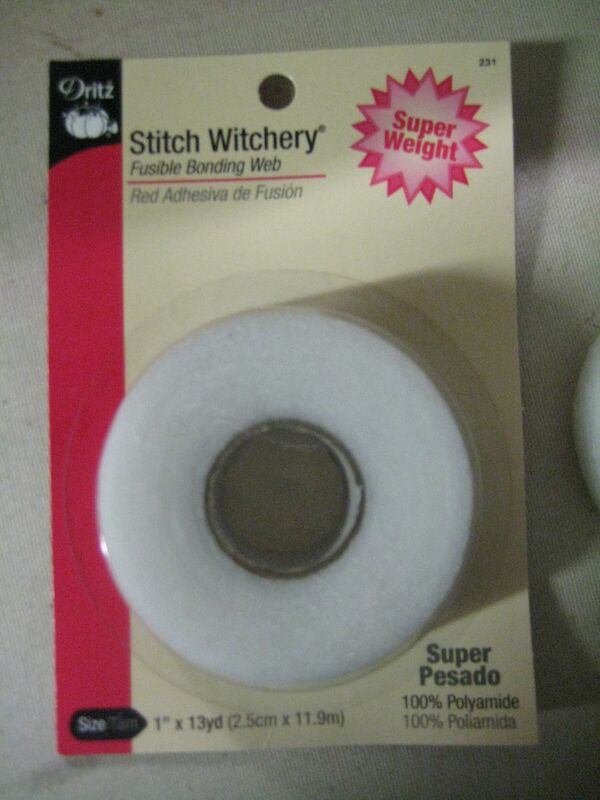 It works, it's fast, and it you need to move it you can re-heat the glue with an iron and pry it loose. 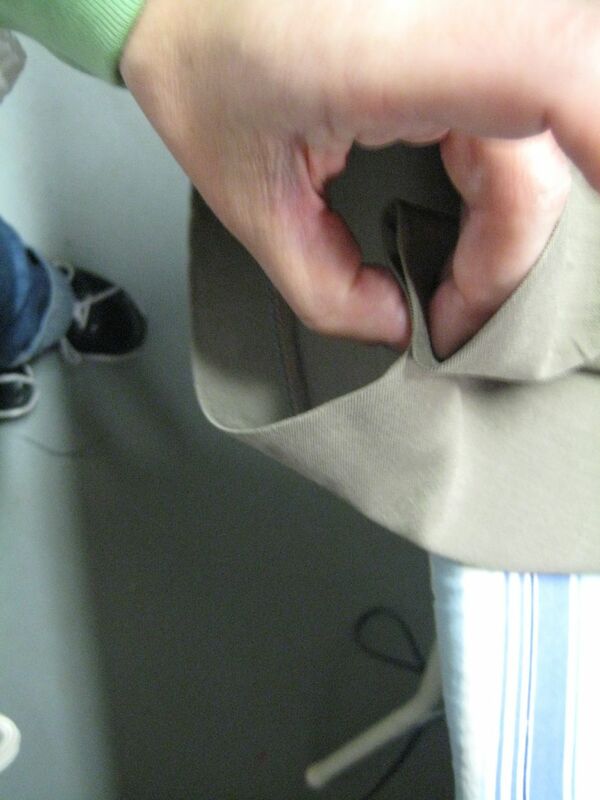 This hem is much to large still. 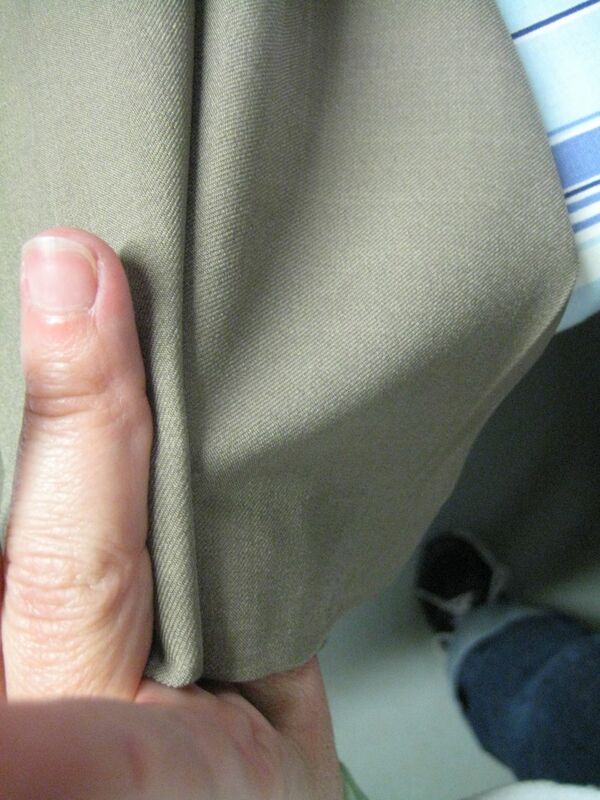 That's ok.
You can remove a lot of fullness by making a little tuck. This will make a nice little fold-over placket. 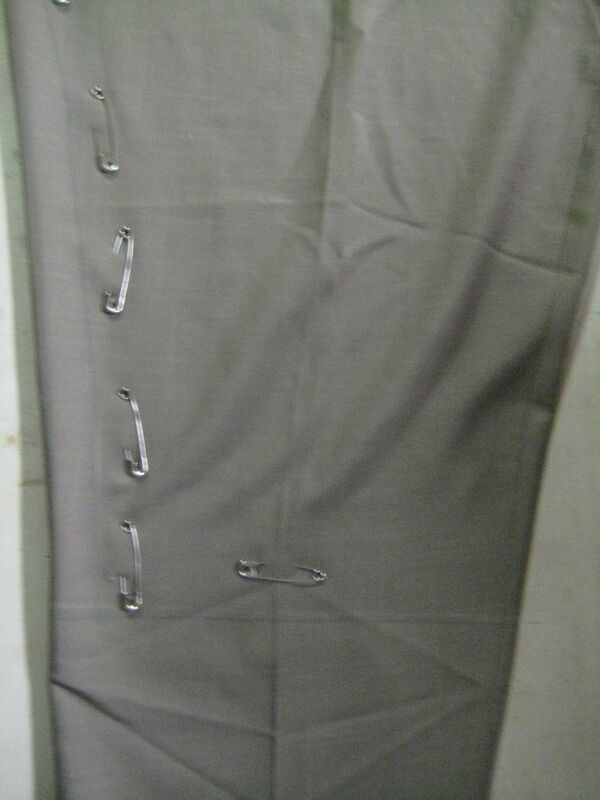 Sew buttons on one side of this pleat, and loops on the other. I use elastic to keep the mending down. 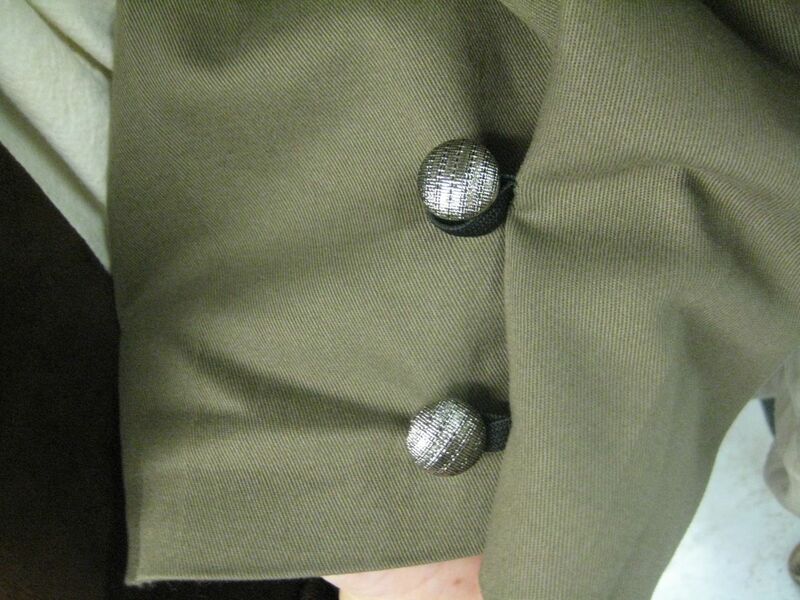 The loops go over the buttons, with snugs the pant down and gives it a nice, period sort of look.